I can hardly believe it's been 20 years since I started working for Roberts Pool Design. I'd been selling windows, doors, trusses, etc. to building contractors when the opportunity to get involved in the pool business came up. It was a good fit from the start and five years later I bought the business. There are a lot of moving parts that need to be managed in getting a pool built. As someone who likes to keep things as simple as possible, one of the things I committed to from the start was hiring a great team. They cost all of us a little more, but they're worth every penny. Most of my team has been with me for 10 years or longer and they know the RPD system - follow the plan, don't cut corners, and be professional. It's why on our international jobs, I bring my own team. 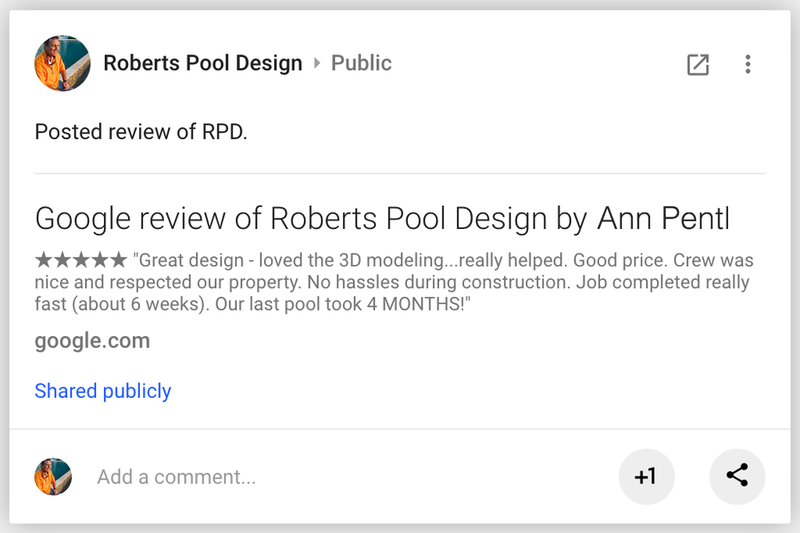 An RPD pool isn't an RPD pool because of the design - it's an RPD pool because it's been designed – and built – by the RPD team. Our clients are often amazed how efficiently we complete a project - normally less than 2 months. It's no secret really. We've developed a solid system and we follow it...over and over. Pool designs change from project to project, but the fundamentals are the same. As John Wooden said when asked how he was able to win so many NCAA championships, "In the end, success is about paying attention to the fundamentals." Simple...just the way I like it. I know pool builders don't have the best reputations when it comes to the sales process, so here's what you can expect if you'd like us to give you a bid. First, straight talk. If I've learned one thing, it's that just about everything works out better in the long run if you create clear, realistic expectations from the beginning. To start, we'll look at some pictures and talk about what you'd like. I'll share any concerns I have and paint a picture of what you can expect. After our meeting, Kyle and I will consult and work up an illustrated 3-D design mockup, present you with a number on what it'll cost and an estimate on when we'll have your project finished. If it all sounds good, and you're feeling like we're the team you've got the most confidence in, we'll set a start date. If you're shopping around, here's what I can tell you: we're always reasonable, but rarely the low bidder...and there a good reason for that. We don't play games with our bids. The number you get is everything we know you're going to need to give you the pool, spa, fountain and/or landscaping that you've asked for. One of the things people hate about contractors is there always seems to be unexpected extra costs, once the projects underway. (I don't know about you, but it drives me nuts when that happens to me.) Operating like that just creates headaches you don't want and I don't need. So, on an RPD job, you can expect to receive ALL the numbers related to your project from the start. In fact, our customers often comment on how much more specific we are on our bids vs. others. If nothing changes, you can expect the quote you receive at the beginning to be exactly what you'll pay at the end. Everyone has their own strategy for navigating what can be a complicated world, and my friends know I can bullsh*t with the best of 'em. But, when it comes to business...for me, it always works best to just lay my cards on the table and go from there. If that works for you, we'll probably get along just fine.